Wash and peel the potatoes, then chop roughly into 1-inch pieces. Place the pieces in the insert of an Instant Pot and add 1 cup water. Remove the insert and place on a heatproof counter or cutting board (as the bottom of the pot will still be quite hot). Mash the potatoes until they are mealy and in small pieces, then add the butter, milk, sour cream, salt, and pepper and mix until well incorporated. Taste and adjust seasonings as desired, adding more butter or cream if necessary. To serve, mince the chives and sprinkle generously over the potatoes. Another secret to getting fluffy potatoes rather than lumpy ones is to mash the potatoes when they are HOT, not warm or chilled, so mash them and add the add-ins as soon as possible after cooking. 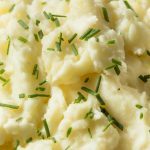 You can refrigerate and reheat the finished mashed potatoes, if desired, but avoid cooling the cooked potatoes before they are mashed.